All HUNTERS CREEK homes currently listed for sale in San Antonio as of 04/24/2019 are shown below. You can change the search criteria at any time by pressing the 'Change Search' button below. 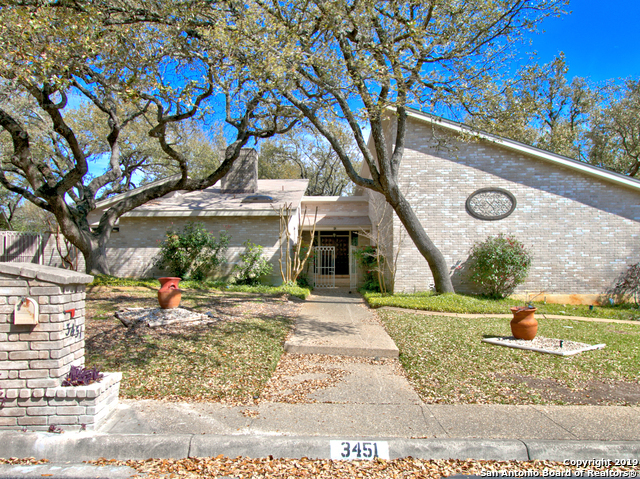 "Distinctive one story in the desirable Hunters Creek neighborhood. This house has a contemporary design with a homey feel. It is spacious and airy with amazing light throughout. The central atrium is an inviting focal point to this home. The custom master bath feels like you are at the spa. The large kitchen with center island is perfect for cooking and entertaining. Side entry garage with a great shop on a corner lot. Plenty of yard space. This unique house is a must see." "Don't delay! You need to see this spacious home in prestigious Hunters Creek North. Very quiet peaceful neighbor that is convenient to all your favorite restaurants and shopping. Easy access to I-10 and Loop 1604. The home has high ceilings and large windows that let in natural light. Master bedroom suite and office is downstairs. Open air atrium and wet bar area. Two rear decks. Schedule your showing today."